Pacific Lumber Inspection Bureau (PLIB) and West Coast Lumber Inspection Bureau (WCLIB) have merged operations into a single entity. The surviving organization, PLIB, will retain all of the trademarks and services formally offered by WCLIB, including the structural glued laminated timber certification services of the American Institute of Timber Construction (AITC) a role WCLIB had assumed since January 2013. PLIB President Jeff Fantozzi will lead the new combined organization from its headquarters office in Federal Way, Wash.
PLIB was formed in 1903 and is believed to be the nation’s longest standing grading agency. WCLIB was originally established in 1911. The combined organization will represent annual softwood lumber volume of more than six billion board feet. While long-time WCLIB Executive Vice President Don DeVisser will follow through with a planned retirement, Fantozzi said that DeVisser will be retained as a technical and engineering advisor during the transition period to help with fully integrating the two organizations. The merger was effective January 1, 2019. The new organization’s Board of Directors will have equal representation from both of the previous organizations and Fantozzi said that it will be “business as usual” as far as the marketplace is concerned because all logos, trademarks and copyrights of PLIB, WCLIB and AITC will be retained and all will continue to be used by producers on their products. He said most members of the respective organizations will continue paying the same dues levels as they had been paying previously and for the most part they’ll be working with the same staff members they’d been working with in the past. Grading, inspection and technical services to approximately 180 softwood lumber manufacturers and remanufacturers in the U.S., Canada and Europe. ISPM 15 certification and inspection services to approximately 300 wood packaging manufacturers in the U.S. and Canada. Heat treating (HT) inspection and USDA APHIS HT certification services to over 50 manufacturers and dry kiln facilities. 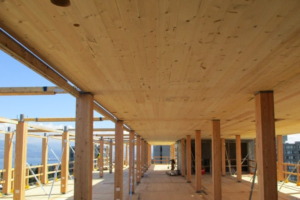 Inspection and technical support to seven glulam manufacturers across the U.S.
Truss inspection services in the U.S. Transient inspection services to producers, consumers, and portable sawmill owners, engineers, etc. in the U.S. and Canada. Fantozzi said that the existing WCLIB headquarters office in Tigard, Ore., which the bureau owns, would remain open as a satellite office for the time being until the building is sold. “We will make a decision on how the locations will be consolidated down the road,” he said. Both PLIB and WCLIB have long, rich histories with longstanding and loyal members. Both organizations have trademarks and rule books that are well established and recognized throughout the world. The combined organization represents members in the western and southeastern United States, British Columbia and Alberta, Canada, and many European countries. Don Roberts 1941-2018. Photo taken 2006. Donald (Don) E. Roberts, inspector and District Supervisor with PLIB, passed away unexpectedly at his home on July 2, 2018 at the age of 76. Don was originally hired by the Bureau in 1979 as an inspector in the Coos Bay, OR district where he worked at the Weyerhaeuser, North Bend mill. 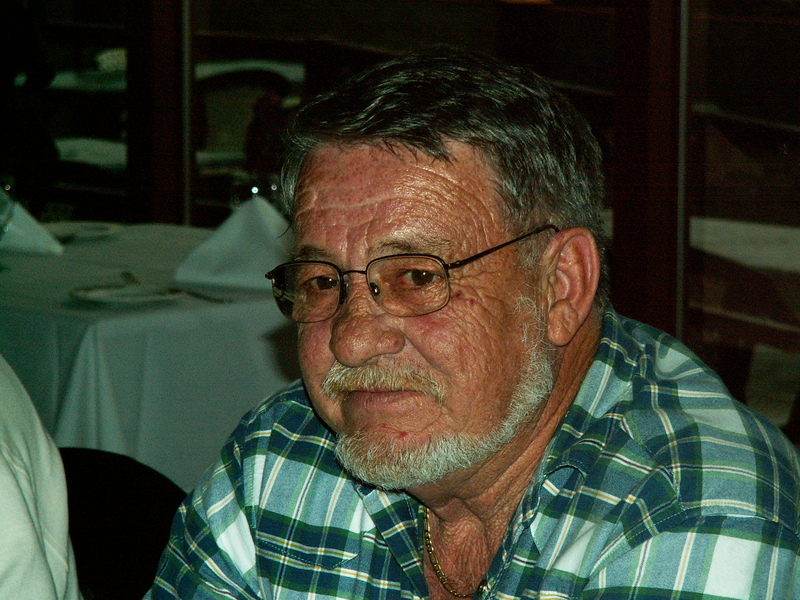 Prior to his involvement in the forest products industry, Don served in the U.S. Navy and was a merchant seaman. 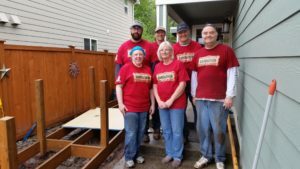 Don gained his lumber industry experience working on the green chain, as a pond man and as a grader at mills in Reedsport, OR and Roseburg, OR. 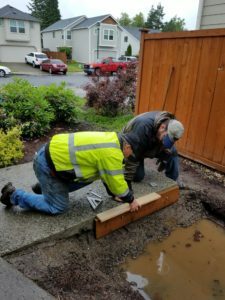 Before accepting the role as a District Supervisor with PLIB in 1986 and while working as an inspector, Don was active in the Northwest Lumber Inspectors Union #20877 and then the United Brotherhood of Carpenters and Joiners of America Local Union No. 2949 where he eventually served as their representative during labor negotiations between the union and PLIB. Don retired from full-time employment with PLIB in 2008 and worked part-time for nearly a year before hanging up his grading crayon and tally book for good in 2009. During his career at PLIB, Don worked with nearly all of PLIB’s member mills in Oregon and Washington at one time or another, developing close relationships with mill quality control personnel. He was responsible for training many graders that are in the industry today. PLIB is grateful for Don’s 22 years of service to the Bureau and its members as a District Supervisor and our thoughts and prayers are with his wife Lynn and family members. Pacific Lumber Inspection Bureau members were excited to start 2018 off by welcoming five new mills to its membership roster. All five mills are located in the interior region of British Columbia. The five new members include Woodco Industries Ltd. in Salmon Arm and four divisions of Tolko Industries (Kelowna, Lakeview, Soda Creek and Quesnel). The new members were approved by PLIB’s Board of Directors at their semiannual December meeting. 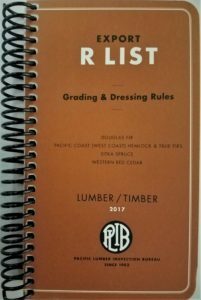 PLIB is accredited in Canada by the Canadian Lumber Standards Accreditation Board (CLSAB) and is an active participant in the CLSAB and National Lumber Grades Authority (NLGA) organizations. It is certified to provide mill supervisory services in Canada for dimension lumber, machine-graded (MSR) and glued lumber under the NLGA rules, European Union “CE” marked lumber, Heat Treated (HT) lumber and IPPC labeled wood packaging through CFIA recognition. The Bureau employs an experienced field inspection staff that is highly respected for their integrity and quality control supervision. PLIB’s newest member mills were joined by several new subscribers to the Heat Treated (HT) lumber and Wood Packaging Material (WPM) programs in the U.S. and Canada. To see a full list of PLIB member mills and the products they produce, click on the green ‘Directory’ box on the PLIB website home page or click here. Oregon State University will be holding it’s Lumber Drying Workshop this year on October 16-18, 2017 in Corvallis, OR. Please follow the link below for more information on the workshop as well as registration information. Tree branches and limbs were used to make an alternative fuel blend that powered an Alaska Airlines flight from Seattle to Washington D.C. The jet fuel was the culmination of research efforts conducted at Washington State University’s Northwest Advanced Renewables Alliance (NARA). 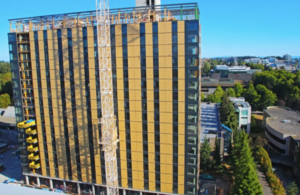 The Brock Commons residence hall at the University of British Columbia has become the latest world’s tallest wood-framed building. The 18-story, $39 million tower is a hybrid mass timber structure designed by Acton Ostry Architects. More than 400 students will move in when the tower is completed in September 2017. 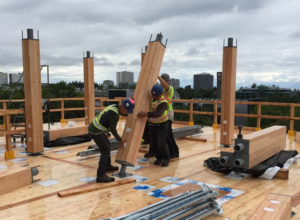 Wood construction started on June 6, 2016 and progressed at a rate of two floors per week. The structure incorporates 1,302 glulam columns and 464 5-ply CLT panels each 169 mm thick throughout the 16 floors of wood construction. It is wrapped in a panelized envelope system. It takes about six minutes for U.S. and Canadian forests to grow the 2,233 cubic meters of wood that was used in this project. The estimated avoided and sequestered greenhouse gases from the wood used in the building is 2,432 metric tonnes of CO2, equivalent to removing 511 cars off the road for a year. Is ISPM 15 wood packaging required in the West Indies? Do we need to stamp wood ISPM 15 for the West Indies? The “West Indies” covers many different islands. Some of them require ISPM 15 certification for wood packaging while others do not show up on the list of countries that require it. Cuba, Jamaica and Trinidad/Tobago are three countries that are listed as requiring ISPM 15 certification. Consider having your wood packaging ISPM 15 certified and labeled as such if you are shipping to the “West Indies” just to be safe. There are several different sets of rules for Western Red Cedar. 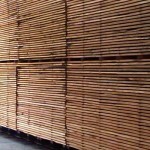 The one that applies to the wood you have will depend in part on what country the wood came from and also on the grade. If the cedar came from Canada, then the rules that cover it may be those published by the National Lumber Grades Authority (NLGA) in Vancouver, British Columbia. Those rules are available on their website at www.nlga.ca. You will find the rules on their “publications” page. If the cedar came from the U.S., the rules could be those published by the West Coast Lumber Inspection Bureau (WCLIB) in Portland, Oregon or rules published by the Western Wood Products Association (WWPA) in Portland, Oregon. The WCLIB rules are available on their website at http://www.wclib.org. You will want to look at Standard Grading Rules No. 17. The WWPA rules are available at their website at http://www.wwpa.org. You will find them under their “publications” page. Finally, it is also possible (but not likely) that the wood was produced under our rules, the Export R List. 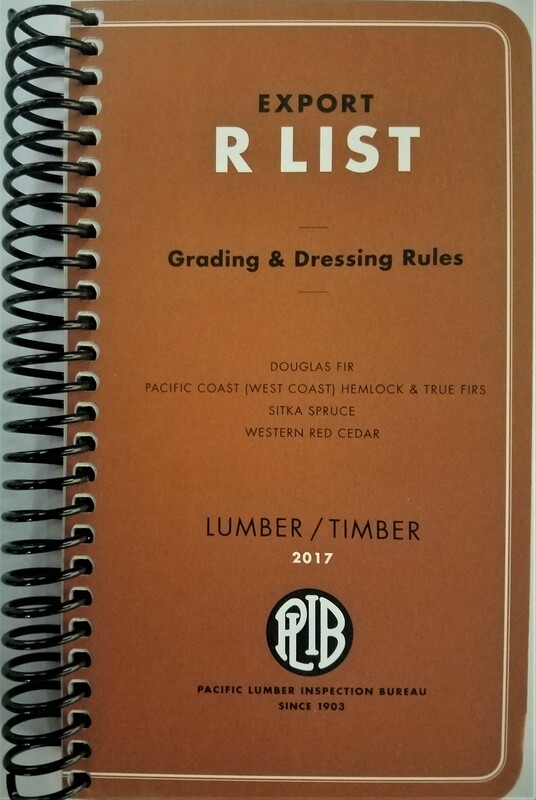 While they are not yet up on our website at this time, if you find that the wood you have was produced under an R List rule, let us know and we will email you the relevant rules. On a wet, rainy Saturday in May, three PLIB staffers and three friends gathered at the Thompson house in nearby Algona and stared at the growing puddle of water and mud that was slowly encroaching on their work space. The weather was far from ideal but the cause couldn’t be better. 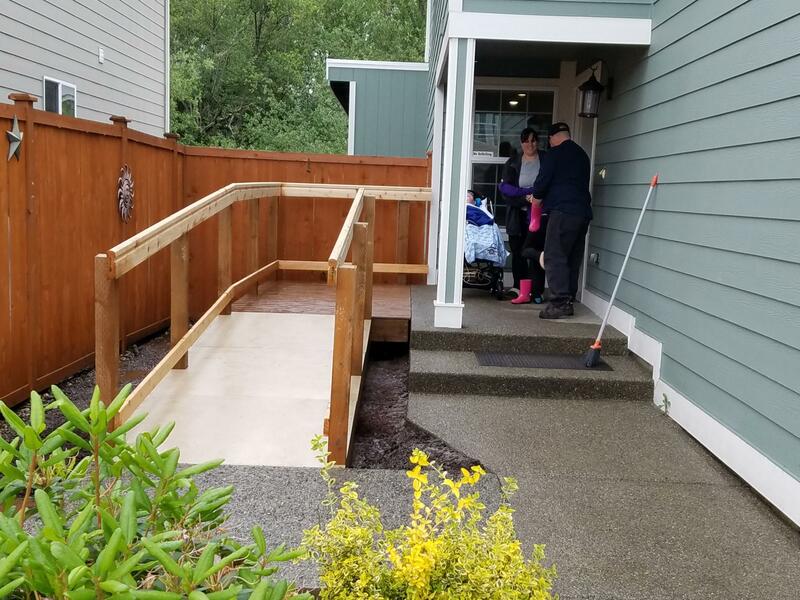 The group had gathered to build a much needed access ramp for Colby Thompson, a six year old boy with severe mobility issues and the victim of shaken baby syndrome. Colby’s case is well known in the State of Washington; it inspired legislation known as the Colby Thompson Act which was signed into law in May 2011 by then Governor Christine Greqoire. The Act aims to address unlicensed child care in Washington State and Colby’s parents fought hard to see that the legislation was passed. They continue to support educational efforts and remain active in the legislative process on this subject. It’s a battle they will fight for the rest of their lives, alongside their precious, sweet son. 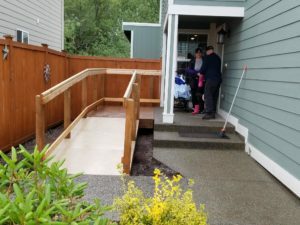 On this particular Saturday; however, the Thompson family would be the recipient of a wheelchair-access ramp that would help mom and dad maneuver Colby’s larger wheelchair in and out of the house, making life a little easier for the family and allowing Colby the opportunity to enjoy the fresh air and sunshine that Washingtonians cherish in the summer months. 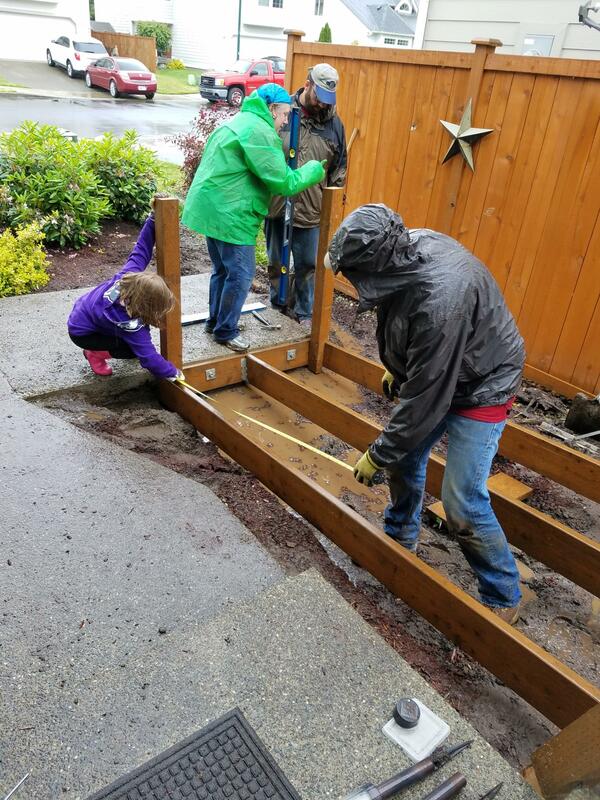 The ramp was built by the PLIB team as part of the Master Builders Association’s (MBA) annual Rampathon event which has been active since 1993. 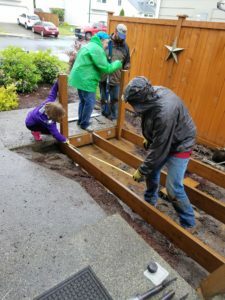 It was the second year PLIB participated in the event (click here for information about last year’s ramp). 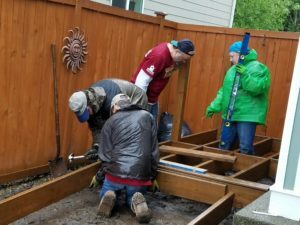 According to the MBA “Rampathon is an annual program…where members and volunteers build free wheelchair-access ramps for…homeowners throughout King and Snohomish counties.” Over 400 ramps have been built and more than 1.7 million dollars in in-kind contributions have been provided as part of the program. 2016 was the biggest event so far, with 37 ramps built. 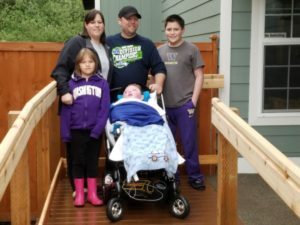 Local and regional media outlets covered this year’s event and you can learn more about the Thompson’s story and other Rampathon participants by viewing KING 5’s coverage of the 2016 Rampathon. The rain and mud didn’t have a chance. 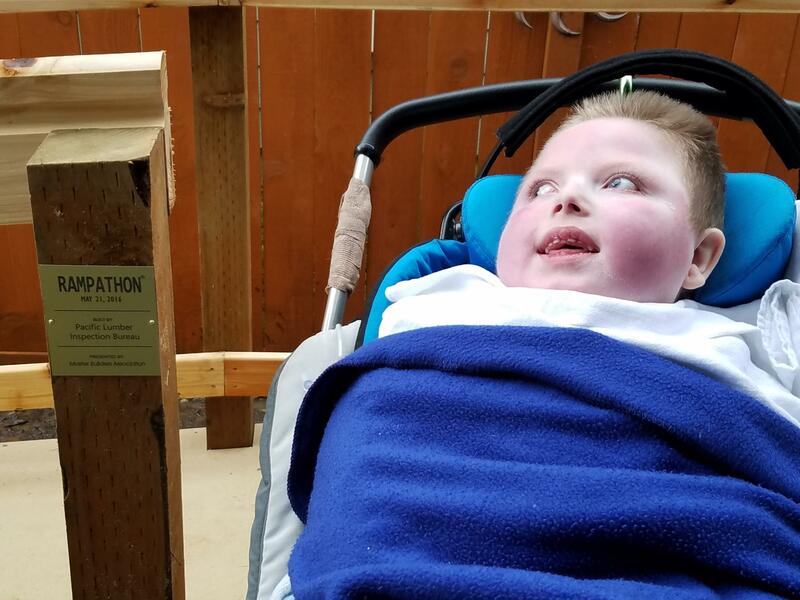 When Colby and his mom rolled down the ramp for the first time, Colby’s smile said it all. For more information on the MBA Rampathon project, see the MBA website www.mba-ks.com or click here.